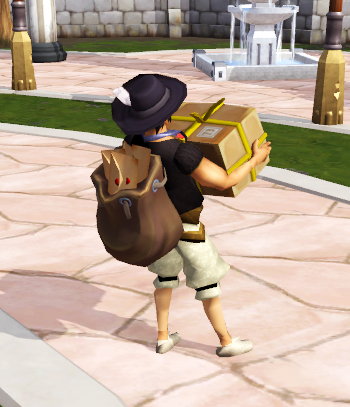 Gielinor’s favourite bony parcelmeister Postie Pete has returned to Burthorpe! He’ll be around for the next 30 days, so make sure to let him know about your safe place if you’re not home to receive your delivery. There are special rewards for logging in for 5, 10, 15 and 20 days throughout the month, which will be delivered alongside your daily parcel. Lost property (5 days - light) - 1 x fan mail, 1 x sealed clue scroll (easy), 2 x small protean pack, 1 x aura refresh. Lost property (10 days - heavy) - 1 x small parcel, 1 x sealed clue scroll (medium), 2 x medium protean pack, 5 x D&D token (daily), 1 x aura refresh, 2 x life refresh, 1 x delivery package. Lost property (15 days - bulky) - 1 x medium parcel, 1 x sealed clue scroll (hard), 1 x large protean pack, 2 x slayer VIP coupon, 1 x deathtouched dart, 1 x small bag of components, 2 x aura refresh, 2 x life refresh, 1 x sack of lost property. Lost property (20 days - weighty) - 1 x large parcel, 1 x sealed clue scroll (elite), 2 x large protean pack, 3 x slayer VIP coupon, 3 x deathtouched dart, 1 x small bag of components, 1 x large bag of components, 2 x aura refresh, 3 x life refresh, 1 x parcel loot beam. You’ll also find some parcels out and about when attending to your normal business. Every time you open one you’ll receive a stamp. Bundles of stamps can be swapped with Postie Pete for items previously found in parcels. 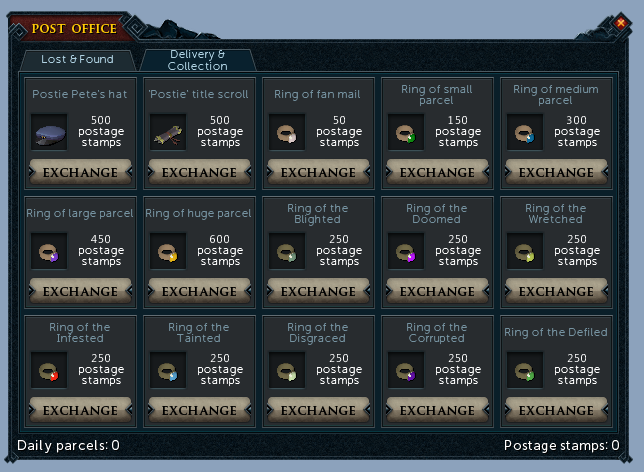 Check out the new UI and tab in the Post Office for the full rundown on all the items that are up for grabs. 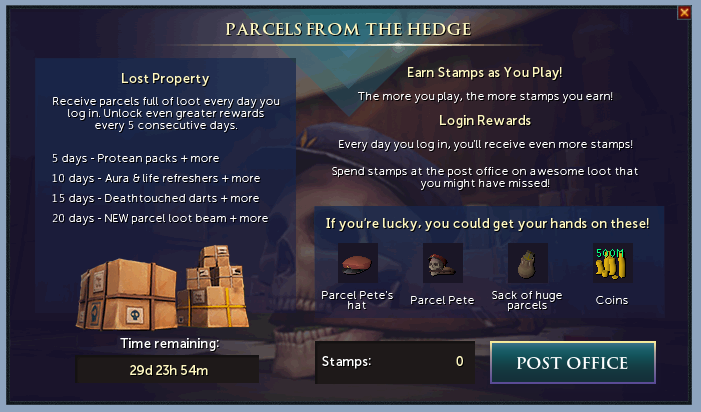 Pete will hold on to your parcel for that day if you run out of inventory space. Log in any time throughout the next 30 days (from today, March 4th) to give yourself a chance of grabbing a parcel a day for 30 days. From a boat load of Mobile changes in preparation for the cap increase, as well as some much needed Engine fixes, read this post to see this week's patch notes! A reminder that we will be raising the player cap for the members-only RuneScape Mobile Beta across Tuesday March 5th and Wednesday March 6th! A further 50,000 spots will be opened up for those wishing to explore Gielinor on Android devices. The cap will be raised in two batches to ensure adventurers on both sides of the globe have the opportunity to get involved. Access to the RS Mobile Beta is on a first come first served basis. Don’t be late! How do I enter the Beta? The RuneScape Mobile Beta is accessible to all members with a compatible Android mobile device. Details on iOS availability will be announced at a later date. This cap increase is another step along the road to an open beta and, ultimately, a full release. Download the RuneScape Mobile Beta app from the Google Play Store. Full details concerning eligibility, restrictions and technical details can be found in the FAQ. Please be aware of scammers. Make sure you only trust our official channels: communications from our website always use the URL runescape.com, our Facebook/Twitter/YouTube/Twitch social accounts have a verified badge next to their name. If you see an advert, make sure you check the link to see if it's genuine. There aren't any active iOS Betas, so if you see an ad claiming otherwise, it's fake. If you have any doubt, DO NOT enter your login or any other personal information. What content can I expect in this Beta? The RuneScape Mobile Beta continues to develop and grow. Recent updates include an overhaul to the NPC chat system (making chat clearer and easier to navigate), the introduction of more intuitive action bars and improvements to looting. There have also been a lot of interaction refinements to improve the recognition of tapping, swiping and dragging. Of course, being a Beta, you should anticipate some imperfections. We are working very hard on ensuring RuneScape on mobile is every bit as playable as RuneScape on desktop, and we actively encourage players to send us their thoughts. Every bit of feedback helps. You'll be able to post your feedback on our new forum section that opens on Tuesday! Additionally we wanted to let you know way in advance of an upcoming Aura sale we wish to do, allowing you to save your Loyalty points in advance! It'll run from 00:00 game time on May 1st 2019 through to May 31st 23:59. All tier 4 & 5 Aura’s are discounted at 25% off. ‘Maniacal’, ‘Reckless’ and ‘Berserker’ as well as now the ‘Dark Magic’ Aura are 30% off. Vampyrism Aura is also a whopping 50% off. Postie Pete has returned to Burthorpe! To celebrate the hard work of our favourite bony parcelmeister, each LootScape in March will award you an extra parcel (uncommon or better). March is the perfect time for a spring clean in Gielinor! As Postie Pete returns to celebrate warmer days, we’re grabbing our feather dusters and oust Bounty Hunter, turn the heat up with Firemaking improvements, revitalise PvM and unify Transmog. Join us for an introductory live stream covering more details on all these upcoming updates! The RS Mobile Android Beta Cap will be raised at the start of this stream. Be sure to join us so you don’t miss when it goes live! On Friday 8th March at 5pm Game Time, we are delighted to be celebrating International Womens' Day. 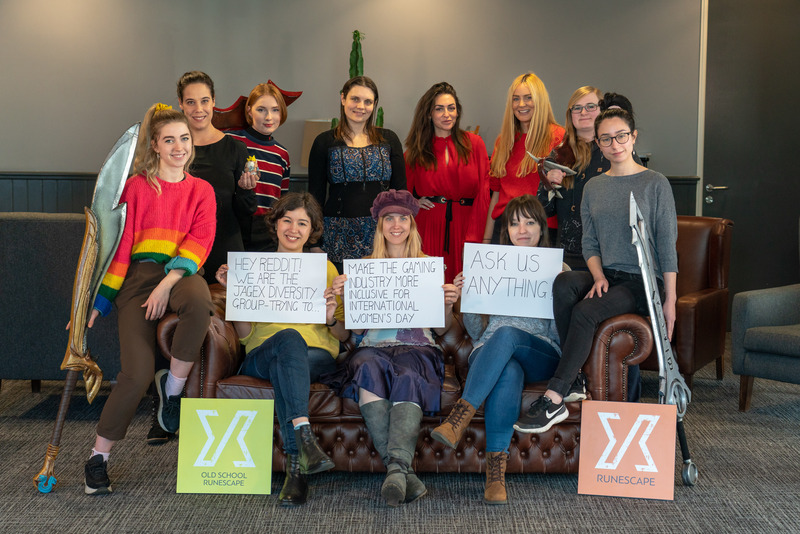 We have teamed up with the IAMA team on Reddit, and a group of female JMods will be online and answering questions about their careers and the games industry, we hope to have you tune in!